Jenika helped me design the 'Storytime with Anna-Christina' logo and we have been working together ever since on ideas for a Music Audio Stories book. Not just any book... a book with activities in! We have come up with a good way to incorporate my Story Time with our book so children can listen, look and learn as they go through our stories. I absolutely LOVE her drawings and her style is so unique and perfect for Music Audio Stories. It helps that Jenika has been reading and drawing comics for as long as she can remember! 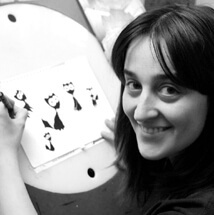 After attending Scuola Romana dei Fumetti (Roman School of Comics) in Italy she moved to the United Kingdom where she self-publishes her award-nominated comic book series Vampire Free Style: the story of a black cat in a world of magic, mysteries, vampires and witches. Her series has sold over 5,000 copies at comic conventions over Europe, has been praised by reviewers, has a loyal following and has been requested as set dressing for the movie 'This Must Be The Place'. All of my characters are based on insects and animals and their adventures. As I am writing the script and their lines, I sometimes have an idea of how I think they may look. I see them as the insect or animal which they are but in cartoon form. At times, I imagine them with a specific or memorable item of clothing on, such as a backward baseball cap or something. Then Jenika will bring them into colourful life on the page! Sometimes I have no idea of how they look and Jenika comes up with sketches and ideas I would never have thought of! It's such a fun process. As well as working on our first book, we are also putting together a 'Storytime with Anna-Christina' package. Lots of parents have been asking me for this when I do my library visits. It's a great idea! They watch me do my Story Time, then they get to take home their own Story Time package and do the activities all over again at home! I can't wait for you to see our characters!